Let's look at 5 values which are timeless and relevant to all working professionals. 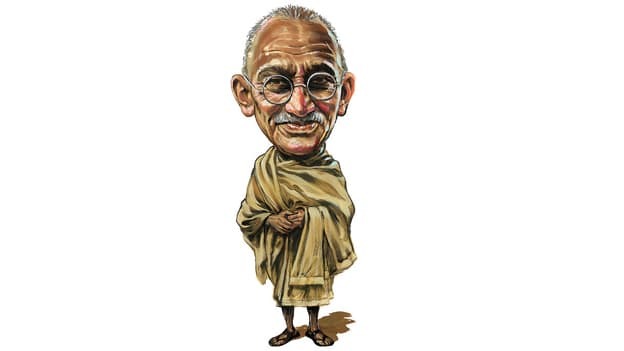 Mahatma Gandhi had a rock-solid value system which led to the inception of his ideas. He aspired to make positive and productive changes in his life at every turn, and had a completely interdependent relationship with his followers. He was a man who believed in action with ideas stemming from his value system. He applied his values of 4 E's: Envision, Enable, Empower, and Energize to make his life great. Gandhi’s greatest quality was to walk his talk in every way and at every level. As leaders, we must lead by example to the most possible extent. Gandhiji practiced what he preached by dressing up like the poorest Indian and having the barest of minimum personal possessions. Through simple small ways, leader can exemplify their leadership by putting their individual interests after the organization’s interest and following the ideas they propagate. A critical success for Gandhi was garnering the right kind of support from the nation and from the international community. He could achieve this primarily due to his extraordinary persistence and articulation of his vision and his methods. His determination to follow through his preaching was often at the cost to his own health but that didn’t deter him from his struggle. His march to Dandi to protest the tax on salt is an epitome of his persistence in following non-violence. Ideas spread in a jiffy and especially when it comes from a fascinating and influential figure. Gandhi was a wonderful strategist, showman, and leader with remarkable public relations network and the right relationship with the press. He created the right impact with his activities and understood the human psyche which helped him with his public relations. As a leader in contemporary times, you can emulate all these qualities of Gandhi and strategize accordingly to materialize your vision. In situations where all the existing methods and tactics had failed, Gandhi reinvented the rules of the game to deal with tricky situations. He broke tradition and followed unconventional approach like non-violence and Satyagraha to deal with the British when he realized that brute force won’t help. Resource constraint did not deter him as he believed to have the courage to invent the means. He advocated having leadership styles that were circumstances dependent to use relevant and effective approach to deal with a problem. Gandhi’s success and sustained reputation makes him a leader worthy to follow and seek inspiration from. He always advised people to lead authentically for the greater good. Gandhi’s relevance, is more so today as many leaders are educated, articulated and ambitious but lack the right value and virtue system. In present times, to lead, managers should not only have the right skills but also a vision for themselves and for others and the right attitude to achieve their goals.